Here is the worsted weight version of the Chains and Ribs Hat and Cowl. This one is easier to adjust in size and can be crocheted for all ages. I love how it turned out, and discovered that it looks great on both sides… so you could wear it inside out if you wanted too. The cowl too can be adjusted to any length and width. The instructions are given for a shorter cowl – it wraps twice, but it’s a snug wrap. I love how it fits, but I know there are some who don’t like anything snug around the neck. So please consider how long you need it as you make your starting chains. This worsted weight version has not been tested, so if you find any errors or typos please do let me know. Thanks so much, and I hope you’ll enjoy. Yarn: Red Heart Super Saver or any worsted weight (4) yarn. I worked off two 7oz. balls and had lots left over on both. Gauge: 2.5″ across 4 (hdc, ch1). Finished Size: Small measures 9″ x 9″ and the larger measures just over 10″ across when laying flat. Cowl measures 19″ x5.5″. The cowl is a snug fit on small adult. 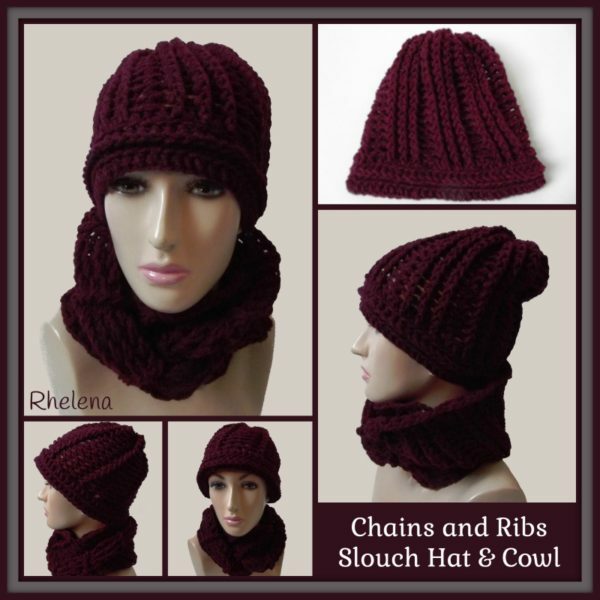 Both hat & cowl can be increased to any length and height. With I hk, Ch 56, (64), or any multiple of 8. Join with sl st in first ch being careful not to twist chs. Rnds 7-21: Rep rnd 6. FO leaving a 10″ tail for weaving in through the last rnd to pull the hat tight. You may have your own way of doing it, but I skipped all chains and went into the back loops of all stitches. With K hk, Ch 120, or any multiple of 8. Join with sl st being careful not to twist chs. Rnds 3-13: Rep rnd 2 until you have reached a desired width. Fasten off at last rnd. Add this pattern in Ravelry or purchase the PDF on Craftsy.